Operate tentacle robot arms. Robotics that mimic living systems are integral to the future of robotics and humanity. In popular culture they are seen in science fiction in cyborgs, superheroes and super-villains. Experience the practical and exciting truth behind such technology and how it can help humanity. This exhibit does not actually contain water. In this instance the water effect is simulated. These arms are totally open framed for educational viewing, which relates to STEM. It is especially designed with safety features and force limits and is also usable for any age range of visitor. The exhibit is configured as demonstration arms to illustrate remote handling applications for robotics. Remote handling robots are used by industry, aerospace and commercial establishments to extend human capabilities in hazardous situations. Each side of the upper frame of the exhibit is a window made of clear poly-carbonate to make it visible from all sides. 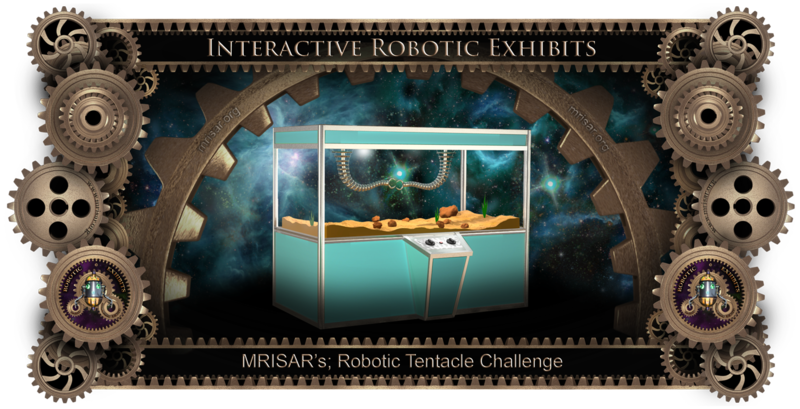 This complete exhibit includes two quality built electronic-electromechanical robot tentacles, fully enclosed exhibit case for the arms, support electronics, visual support materials, maintenance information and schedule, activities and control panel. Case size is 35” deep x 7.5’ wide x 72” high. Exhibits are available in a wide variety of colors.